American Postal Workers Union (APWU) flier. 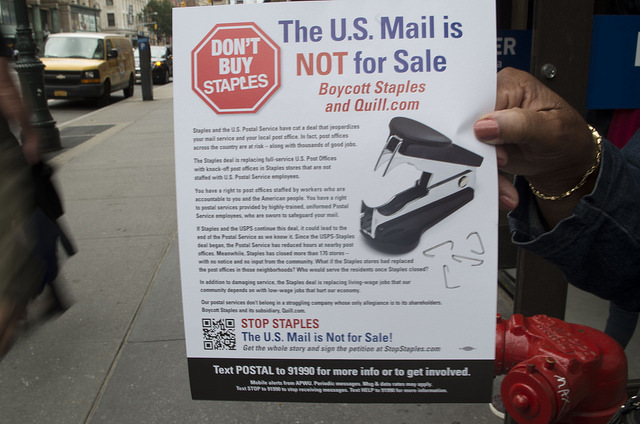 The APWU was calling for a boycott of Staples and its merchandising website, Quill.com, after several USPS jobs and services had been outsourced to Staples. Photo by Dale Isip. With a light grey beard and a pleasant smile, John J. Dennie, 74, from Staten Island, handed out fliers outside of a Staples store in Chelsea, Manhattan. He wore a light blue hoodie and a U.S. Postal Service cap as he tried to get his message out to afternoon passersby. His message was postal jobs are being outsourced to Staples and postal workers are losing their jobs. “The postal service is in the process of being privatized, and what they want to do, basically, is replace unionized postal clerks with Staples employees,” said Dennie. 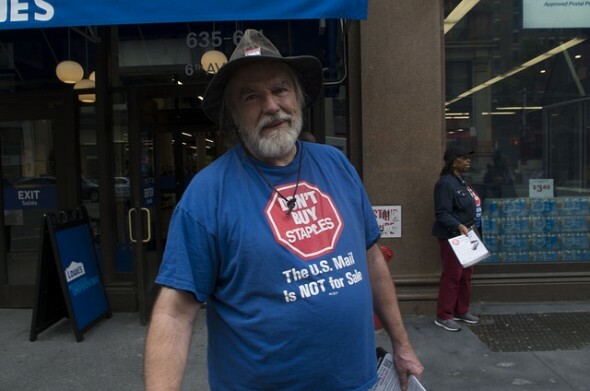 Dennie was among a group of about ten members of the American Postal Workers Union (APWU) who were calling for a boycott of both Staples and its merchandise website, Quill.com. They demonstrated today outside of a Staples store at 20th Street and 6th Avenue. The protesters were concerned about the loss of existing Postal Service jobs – and along with them, the training, higher wages, and health care benefits they offered. “Staples won’t let any of their workers work more than 25 hours a week, so it’s a part-time, low wage, no benefit job,” said Dennie. “[The] Postal Service wants to bust our unions, basically, and this is part of it, to subcontract everything to no-union employers”. The U.S. Postal Service has been operating in a financial deficit in recent years. Starting in 2012, the Postal Service consolidated 143 of its processing centers . In 2013, Postal Service leadership made a deal with Staples to offer postal services in Staples stores. This was considered a controversial, illegal action among Postal Service union workers because the APWU was not bargained with first. Those at the protest today were predominantly older, retired Postal Service employees. APWU member Dennis O’Neil, 65, from Harlem, saw good reason for their enthusiasm. O’Neil also noted the importance of getting the public aware of changes within the U.S. Postal Service and the outsourcing of once-public jobs to private companies. “People are unaware of what’s happening, and even if they see it, they think, ‘Well it’s an approved thing by the post office, I guess it’s okay,’ but once we tell them about the damage that’s being done, they listen,” O’Neil said as he pointed to the U.S. Postal Service logo on the Staples storefront. That damage would arguably include a loss of living-wage jobs. Staples employees make only about $8.50 or $9.50 an hour, while the average Postal Service employee makes about $25 an hour. This was enough for passer-by Mark Hurston, 54, to support the protesters. Dennie said the protests have had mixed results.